Anyone who knows me knows my dumpling cravings are insatiable. I could seriously eat them morning, noon, and night, seven days a week without a single complaint, partially because there is such a vast variety of delicious dumplings to satisfy every dumpling desire. I couple weeks ago, I shared a recipe for Chinese chive dumplings, but what I didn't mention was that on the same day I made those dumplings, I actually made a total of three varieties of dumplings. I made a total of 82 dumplings in three varieties all by my self, completely from scratch, just because I love dumplings and I wanted lots in my freezer (they didn't last nearly as long as they should have for a normal person). 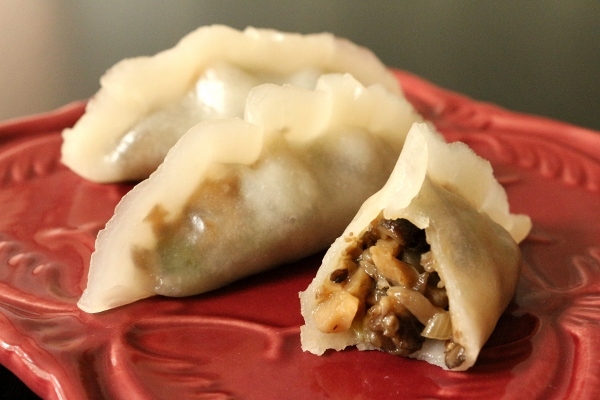 The second variety of dumplings I made that day was three-mushroom dumplings, containing a combination of dried shiitake, cremini, and oyster mushrooms, all wrapped in a delicate, translucent wheat starch wrapper and steamed to perfection. 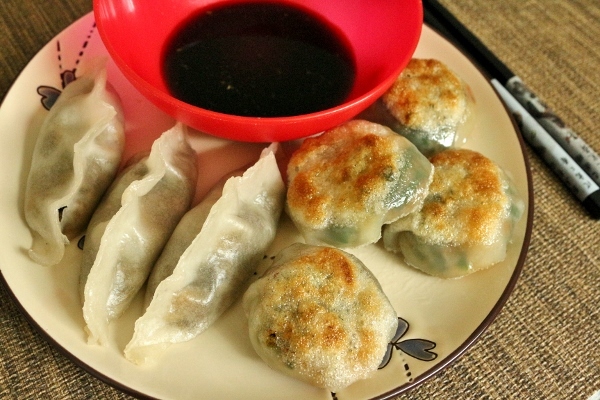 With the exception of the oyster sauce in the filling (which can be swapped out for vegetarian stir-fry sauce) these dumplings are vegetarian, but feature a hearty filling that stands in for a meatier one in a pinch. Because they are made with wheat starch wrappers, they MUST be steamed before refrigerating or freezing. It does take a little extra time, but if you have more than one steamer basket to stack, it really only takes a couple batches to steam them all. If you aren't able to procure wheat starch (you will only find it at Asian markets and online), you can definitely use the same filling with a basic flour-based dumpling dough and then either steam, pan-fry, or even boil them (to boil, just shape them into basic crescent shapes without crimping). In fact, the first time I made this filling, I used it for steamed dumplings using the basic dumpling dough--and can I just say, my dumpling-making techniques have come a long way since then! To make the filling: Put the shiitake mushrooms in a small bowl and cover with hot water. let them stand for 30 to 45 minutes to soften. Drain the mushrooms and cut off and discard the hard stems. Rinse the caps, squeeze them dry, and chop fine. Heat a wok or skillet over medium-high heat, then add the oil. When it is almost smoking, add the fresh and dried mushrooms, scallions, and cilantro and stir-fry over medium heat for 4 minutes, or until most of the liquid has evaporated. 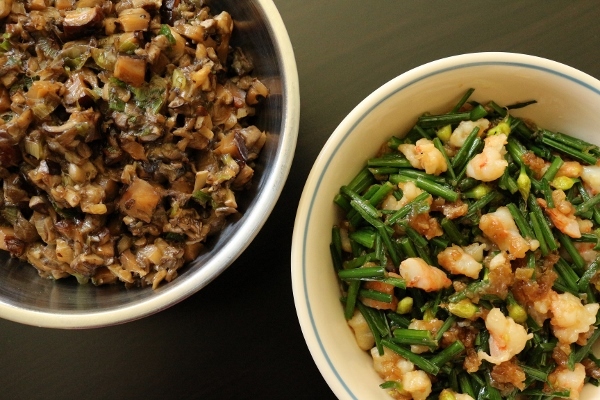 Reduce the heat to low, stir in the oyster sauce, rice wine, soy sauce, sugar, and pepper, and then add the cornstarch mixture and cook for 1 minute longer, or until the sauce has thickened. Let the filling cool before forming the dumplings. The filling can be covered and refrigerated up to one day ahead. To make the dough: In a bowl combine the wheat starch, tapioca starch, and salt. Make a well in the center and pour in about 14 tablespoons of the water. Use a wooden spoon to stir the ingredients together (mine actually snapped in half, oops; next time I may use a large metal spoon instead). The dough will look translucent at first and then become mottled, whitish, and lumpy. Once the water has been incorporated, add the oil. Stir to work in the oil. If the dough looks dry, add a little more water. Aim for a medium firm texture, not a soft and mushy one; work in additional wheat starch by the tablespoon if you add too much water. Press the ingredients together into a rough ball that feels a bit bouncy. Transfer the warm tough to an unfloured work surface and knead for 1 to 2 minutes, until snowy white, smooth and resembling Play-Doh in texture. When you squeeze on it, it should not crack. If it cracks, very lightly oil one hand and knead it into the dough to increase the dough's suppleness. Cut the dough into 4 equal pieces and put them into a zip-top plastic bag and seal well. Set aside for 5 minutes to rest before using. This dough can be made up to 6 hours in advance and left at room temperature in the zip-top bag. Before assembling the dumplings, line steamer trays and baking sheets with parchment paper (perforated preferred for steamer trays), then oil the paper. Have ready 2 (6 to 7 inch) plastic squares cut from a zip top bag (I leave mine connected on one end to make it almost like a book); smear a little oil on one side of each plastic square to avoid sticking (the inner surfaces if you've left yours connected on one end like mine). Working with 1 piece of dough at a time, roll it on an unfloured work surface into an 6-inch long log. Cut the log into 6 equal pieces. To prevent drying and sticking, dab your finger in some canola oil and rub a tiny bit on each of the ends of the dough pieces, pressing each one into a 1/4-inch-thick disk as you work. Place a disk between the squares. 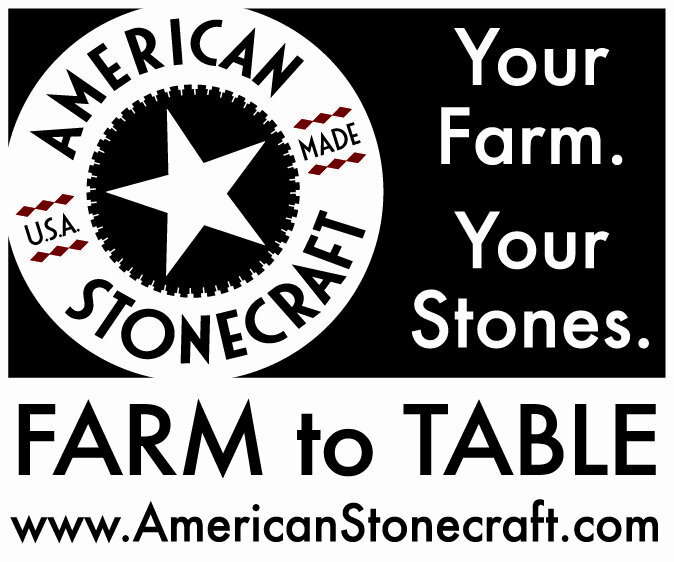 Apply moderate pressure with a tortilla press, the flat side of a cleaver, or the bottom of a large measure cup, skillet, or plate. You maybe have to press more than once to arrive at the desired size (about 3 1/2 inches in diameter). Unpeel the plastic and set the slightly shiny wrapper aside. Repeat with the remaining dough pieces. There should be no need to re-oil the plastic between pressings. To prevent the dough from drying, assemble a batch of dumplings before forming more wrappers from another portion of dough. To assemble a dumpling, hold a wrapper in a slightly cupped hand. Scoop about 1 scant tablespoon of filling slightly off-center toward the upper half of the wrapper, pressing down gently to compact and keeping about 1/2 to 3/4 in ch of wrapper clear on all sides. Bring up the edge and seal to make a half-moon. Press the rim to meld the edges into one. Set the dumpling down and gently scrunch up the rim to create a ruffled edge. Bring up the ends so it sits proudly upright. If the skin breaks, dab a tiny bit of oil on the area and try smoothing out and patching up the wrapper. Set the finished dumpling in a prepared steamer tray. Assemble more dumplings from the remaining wrappers before working on the next batch of dough. Space them about 1/2 inch apart (if using a metal steamer tray, keep the dumplings 1 inch away from the edge where condensation will collect). 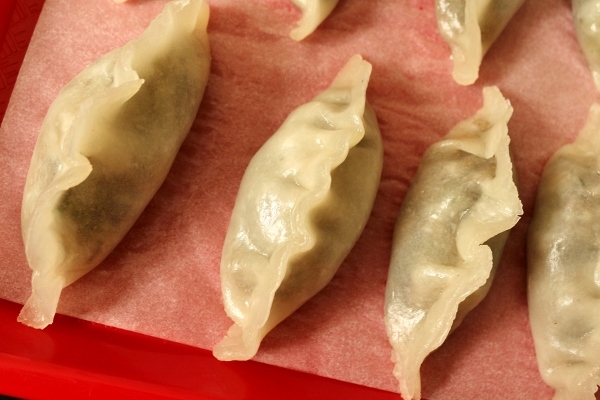 Place overflow dumplings on the baking sheet with a good 1/2 inch between each and cover with plastic wrap. Once assembled the dumplings should be cooked as soon as possible, because they cannot be refrigerated uncooked. Steam the dumplings over boiling water for about 7 minutes, or until they have puffed slightly and are glossy and translucent (they will become more translucent as they begin to cool as well). Remove each tray and place it atop a serving plate. Serve hot with soy sauce or dipping sauce, if desired. 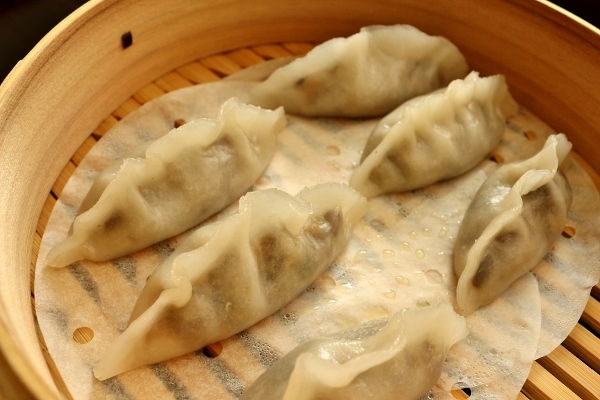 Cooked dumplings can be refrigerated and then steamed for about 3 minutes before serving. 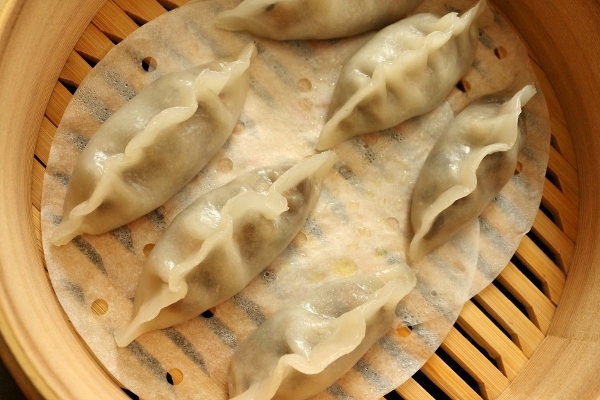 Cooked dumplings can also be frozen for up to 1 month, completely thawed in the refrigerator (covered), and steamed for 3 to 5 minutes. These dumplings MUST be cooked before being refrigerated or frozen.